New Stoke boss Paul Lambert joked he had "forgotten what it was like" to be on the touchline as he marked his return to the Premier League with victory over Huddersfield. Former Norwich and Aston Villa manager Lambert was the surprise choice to replace Mark Hughes after three years away from the top flight. He secured a win at the first time of asking thanks to second-half goals from Joe Allen and Mame Biram Diouf, which lifted the Potters out of the bottom three. After an animated display in his technical area, Lambert was asked how he felt. "Terrible," he said. "I'm tired. I'd forgotten what it was actually like. "You sometimes wonder why you come back in. I was enjoying my life last weekend, but it's for this - the atmosphere was outstanding. "From the moment I came to the club, it was about the supporters and the players and they bounced off each other. You can't hear yourself shout at times. "If they stick together and we play that way, we might not win every game, but if we keep that level of intensity, we will be fine." Huddersfield, without a league win since 16 December, rarely threatened. Steve Mounie had the Terriers' best attempt, a well-struck effort from distance straight at Jack Butland late on. Peter Crouch, a target for Chelsea, came on for the final 15 minutes for the hosts. It could be the striker's final appearance for the club if a move materialises as the Potters are not in action again until 31 January - transfer deadline day. Stoke moved up to 17th with the victory, while Huddersfield are three points above the relegation zone. 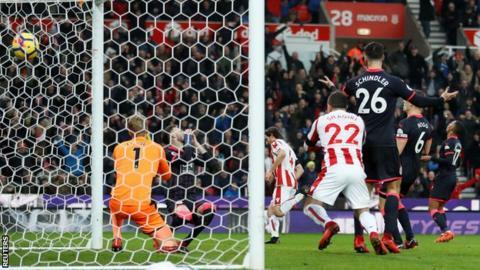 Lambert succeeded Hughes on Monday, and immediately highlighted Stoke's leaky defence as something that needed fixing if they were to pull away from the relegation zone. The 3-0 defeat at Manchester United just hours after Lambert's appointment meant Stoke had conceded 50 goals after 23 games. That is the third worst record at this stage of any Premier League season and made them the first club in Europe's top five divisions to reach the half-century. Lambert was boosted by the return of centre-back and captain Ryan Shawcross - in the side for the first time since 26 December after recovering from a calf injury - and there was certainly much more steel in the Stoke backline against a Huddersfield team who failed to manage a single shot on target in the first half. The Potters will certainly face sterner tests than a team who have scored just eight goals away from home all season, but having conceded 10 in their three league games prior to this, this was a positive step. Favourites for relegation at the start of the season, Huddersfield have surpassed many people's expectations in their first Premier League campaign, but their recent form will be of serious concern for manager David Wagner. The Terriers have lost their past three league games, and not won in six. Playmaker Alex Pritchard, signed this month from Norwich, was brought in to try to add creativity to an attack that has been so often lacklustre this season. They have scored the fewest amount of goals in the Premier League - 19 from 24 games - and while they had three shots on target here, none truly troubled Butland. Huddersfield were promoted by playing a brand of football that relied on slick, one-touch passes to quickly turn defence into attack - but that was not evident against Stoke. Just 55% of the visitors' passes successfully found a team-mate. Stoke City boss Paul Lambert, speaking to Match of the Day: "There's a lot of quality. We shouldn't be in the position we're in. Mark Hughes did a fantastic job here for four years, Tony Pulis before him. "The lads know for whatever reason they've been underperforming but big compliments to them today, they were fantastic." Huddersfield manager David Wagner, speaking to Match of the Day: "It was difficult. For me, it was because Stoke and their supporters were really on it. They were really aggressive and limited us and I felt they deserved it. They limited our offensive game. "It shouldn't be a surprise that Stoke is a top-quality side even if they are not in the best position in the table. We fought and tried everything but were limited offensively. "I have to accept where we are in the table. It's only us who can change it. We have fought since the first day of the season and, even though we have now six games with only three points, we know we have to collect more points to survive." Diouf's goal was his 22nd in the Premier League for Stoke - making him their joint-third highest goalscorer in the competition (Jonathan Walters 43, Peter Crouch 43, Marko Arnautovic 22). Lambert earned his first win as a Premier League manager in 11 games - since his Aston Villa side beat Leicester 2-1 in December 2014. The Potters kept their first clean sheet in the Premier League since October (1-0 at Watford), having conceded 30 goals in their 13 previous games. The Terriers are now winless in six Premier League games, losing each of the past three in a row (D3). Allen has had a hand in four goals in his past five Premier League games (two goals, two assists), as many as in his previous 43 combined. It is another home game for Stoke next as they host Watford on Wednesday, 31 January (15:00 GMT). Huddersfield, meanwhile, host Championship side Birmingham in the fourth round of the FA Cup on Saturday, 27 January (15:00 GMT). Their next Premier League game is at home to Liverpool on Tuesday, 30 January (20:00 GMT). Match ends, Stoke City 2, Huddersfield Town 0. Second Half ends, Stoke City 2, Huddersfield Town 0. Offside, Stoke City. Peter Crouch tries a through ball, but Ramadan Sobhi is caught offside. Substitution, Stoke City. Ramadan Sobhi replaces Eric Maxim Choupo-Moting. Offside, Stoke City. Xherdan Shaqiri tries a through ball, but Eric Maxim Choupo-Moting is caught offside. Geoff Cameron (Stoke City) wins a free kick on the right wing. Foul by Rajiv van La Parra (Huddersfield Town). Joe Allen (Stoke City) wins a free kick in the defensive half. Foul by Steve Mounie (Huddersfield Town). Attempt saved. Steve Mounie (Huddersfield Town) right footed shot from outside the box is saved in the centre of the goal. Delay in match Christopher Schindler (Huddersfield Town) because of an injury. Attempt missed. Eric Maxim Choupo-Moting (Stoke City) right footed shot from the centre of the box is too high following a fast break. Foul by Darren Fletcher (Stoke City). Scott Malone (Huddersfield Town) wins a free kick in the defensive half. Offside, Stoke City. Ryan Shawcross tries a through ball, but Peter Crouch is caught offside. Hand ball by Aaron Mooy (Huddersfield Town). Substitution, Huddersfield Town. Laurent Depoitre replaces Jonathan Hogg. Attempt missed. Collin Quaner (Huddersfield Town) header from the centre of the box misses to the right. Assisted by Aaron Mooy with a cross following a set piece situation. Foul by Geoff Cameron (Stoke City). Abdelhamid Sabiri (Huddersfield Town) wins a free kick on the left wing. Substitution, Stoke City. Peter Crouch replaces Mame Biram Diouf. Abdelhamid Sabiri (Huddersfield Town) wins a free kick in the attacking half. Foul by Erik Pieters (Stoke City). Collin Quaner (Huddersfield Town) wins a free kick on the right wing. Attempt saved. Rajiv van La Parra (Huddersfield Town) right footed shot from the left side of the box is saved in the centre of the goal. Assisted by Aaron Mooy. Attempt missed. Jonathan Hogg (Huddersfield Town) right footed shot from outside the box misses to the right. Assisted by Scott Malone with a headed pass following a set piece situation. Moritz Bauer (Stoke City) is shown the yellow card for a bad foul. Foul by Moritz Bauer (Stoke City). Rajiv van La Parra (Huddersfield Town) wins a free kick on the left wing. Substitution, Stoke City. Geoff Cameron replaces Charlie Adam. Goal! Stoke City 2, Huddersfield Town 0. Mame Biram Diouf (Stoke City) right footed shot from the centre of the box to the bottom right corner. Assisted by Xherdan Shaqiri. Kurt Zouma (Stoke City) wins a free kick in the defensive half. Attempt saved. Xherdan Shaqiri (Stoke City) left footed shot from the right side of the box is saved in the bottom right corner. Assisted by Joe Allen. Offside, Stoke City. Charlie Adam tries a through ball, but Eric Maxim Choupo-Moting is caught offside. Erik Pieters (Stoke City) wins a free kick in the defensive half. Foul by Abdelhamid Sabiri (Huddersfield Town). Foul by Ryan Shawcross (Stoke City). Steve Mounie (Huddersfield Town) wins a free kick in the attacking half.